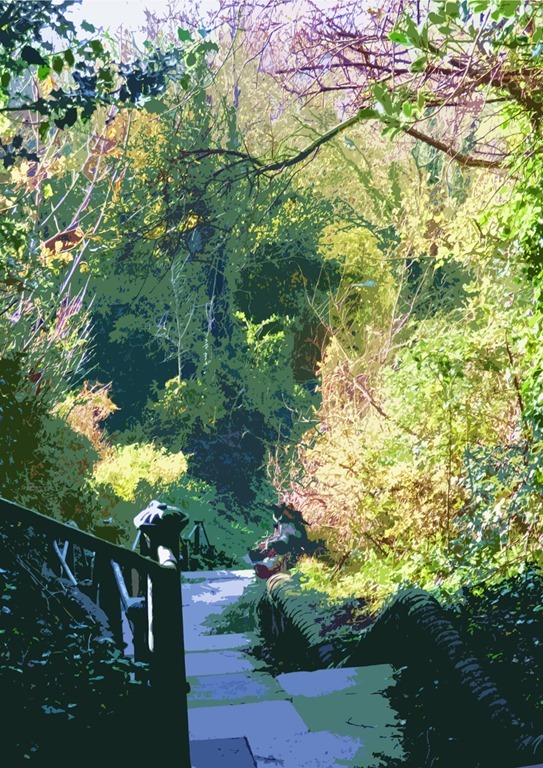 Bracing East Hill announces the start of Hastings Country Park that stretches almost 4 miles – all the way to Fairlight along the Saxon Shore Way and even further to Winchelsea and Rye. It is a coastline of ancient woodland, heath and grassland, of dramatic cliffs and hidden coves ideal for landing smuggled brandy for the parson. Another day, you might want to do that walk with a pub stops at the Smuggler (Cliff End), The New Inn (Winchelsea) and The Mermaid (Rye) with the bus back to Hastings. 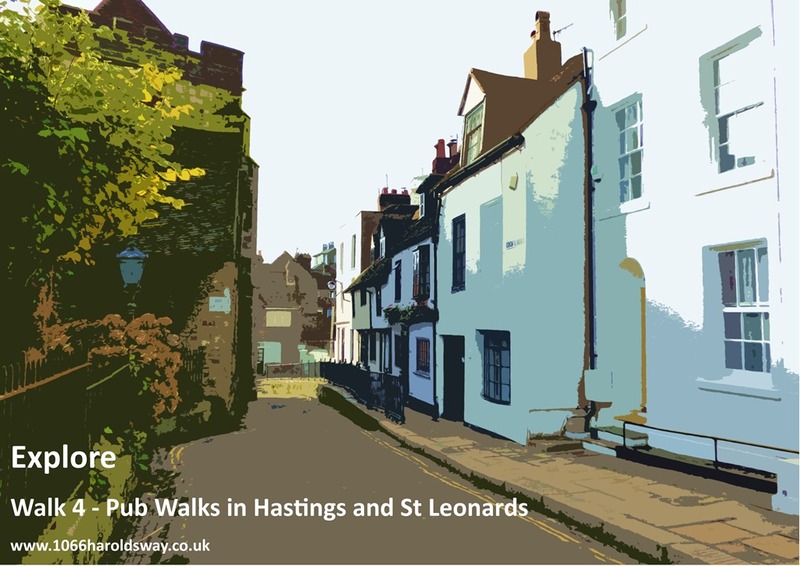 There are full walk instructions in History Walks 4 – ‘Hastings to Rye, Rye to Hastings’ available from the usual outlets and from History Walks. But today it is a shorter walk, up and across East Hill, with the reward of picture postcard views of Hastings and St Leonards and the coastline all the way around to Eastbourne and Beachey Head. If you do not do steps, take the funicular railway to the top of East Hill. Opened in 1903 it is the steepest such railway in the country. The open grassland on East Hill hides traces of archaeological activity spanning at least 4000 years and bounded by earthen ramparts. The earliest boundary walls may well belong to the 1st Millennium BC and are similar to a number of other promontory forts that date from the Iron Age. The raised area at the top of the hill is believed to be the site of a medieval graveyard, perhaps on top of an earlier Iron Age barrow, and to be there on a windy day sets your cheeks aglow. Hastings Old Town is still a delightful mix of half-timbered houses, narrow streets and passageways and is home to the largest beach-launched fishing fleet in Europe. Coastal erosion, sea damage and silting reduced the effectiveness of Hastings as a port. The ports of Rye and Winchelsea quickly outgrew Hastings until, the great storms of the late 14th century, when serious flooding, damaged most of Hastings along the Bourne. Walking along All Saints Street you can see the evidence of the rebuilding in some of the oldest surviving houses in Hastings. They give the Old Town a medieval feel and much to talk about over a pint at The Cinque Port Arms or The Royal Standard. A fitting end to a fine walk. With Hastings Castle still dominating the town, any book of Hastings walks should include a trip to visit a castle that is so steeped in the history of England. It was the Norman Conquest in 1066 that thrust West Hill into the limelight and there is still enough left, after the ravages of nature, to fuel the imagination – helped by the excellent story boards, and the audio-visual programme, that cover the Conquest and the history of the castle. There is a short climb up Victorian steps but to add to the fun, the West Hill Lift, with its original wooden coaches, will whisk you up to the top where, on a clear day, you may be able see the coast of France. Closer are the old narrow streets and rooftops of Old Town, the fishing beach and views of the whole of Hastings and St Leonards and in the distance are the South Downs, Eastbourne and Beachy Head. The grassy West Hill is a delight and it is only a short walk to The Plough for a beer, before tackling the easier downhill part of the walk that finishes at The Albion. Timeless Old Town, a walk of narrow streets, alleyways, steps this way and that, of Smuggler’s Caves and Foyle’s War – it is such a mix of back streets, cottages and tiny gardens of pots and troughs that it is almost a surprise that George Street appears below. There are pubs and bars galore along George Street and most warrant a pint or a note in that beer stained note book to return another day.